Chief Galbraith is repairing the head [new seats and spark plug hole and threads + grinding and polish] and Walt Waiton is welding up the erosion and crack below seat in intake port. Walt has a welder that doesn't put much heat in the head while welding. Hard to figure out exactly what happened 1st, but Chief pointed out if the rod was coming loose and the piston hit the head it would collaspe the ring lands and the rings wouldn't seal. That would let the burned gasses blow a hole in the piston. That would explain while the hole is on the intake valve side instead of the hot exhaust side. I wouldn't recommend using aluminum rods in LSR. In short track or drag racing they're OK if you change them now & then. The problem is that aluminum has much lower fatigue strength than steel and in applications where you're running high power for a long time, such as LSR, off-shore boat racing, or NASCAR, aluminum rods are much more likely to fail than good forged steel rods such as Oliver, Crower, Carillo, etc. I'm not trying to be a know-it-all-- just a suggestion. Niel.. there must be a reason all the top fuel and alcohol racers don't use chomemoly rods. I understand its because aluminum has more give and doesn't beat the bearings out. I don't believe the rod failure was the rods fault, it either wasn't tightend right our it was torched off at the top end. The pin was even torched. My guess is that the aluminum rods give them lower reciprocating weight and therefore lower moment of inertia. This allows the crank to accelerate faster. Who makes a steel rod strong enough? I haven't seen any advertised that can handle mid to high hp motors. Give u's some hints. Try the usual guys-- Crower, Oliver, Carrillo, Lunati, etc. Call and ask those factories for their recommendations. Yea, that doesn't always work either! I ordered a billet crank and rods from Crower. I specified that it was for a blown motor for 500+ HP- a Loooong ways from Langlo's HP. Now remember, these were one-off, custom made for the application! When I decided to redo the engine this winter, and shoot for 700HP, I called and asked them if the parts I bought would handle the HP. The answer I got was- "we weren't even confortable with 500 HP!" WTF? Point is, I don't know if anyone is going to say "yep, our stuff will handle it." The fact that you've had fair luck with the aluminum make me think I'd just keep running them, unless I really felt the rod gave out from fatigue, and it's already been stated that probably wasn't the problem. Sorry to see the carnage, but I know you'll get it fixed, and go about your business as usual! I looked all those up and the most hp rating I could find was 1500. Not going to call, as I'm not going against the experience of the many racers using aluminum rods in 500'' hemi's. 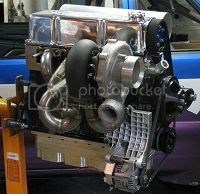 I have no clue on which rods to use for a high HP engine other that what has been stated. But, there is always one, is eveywhere getting enough oil. These "mini" engines are using squirters towards the pins. I'm sure 1/4 milers don't need this but maybe 5 milers do. Is the only oil to the pin splashed or from the oil rings and is that enough. If most of the oil is from rod side clearance are scrapers used and removing too much? Are vacuum pumps being used along with multi-segment dry sump pumps causing too much vacuum? Heavy duty engines have rifle drilled rods to feed the pins. I have no idea if that can be done with aluminum or not. Cunningham will drill I beams but not H beams. When talking to a rod manufacturer, it's necessary to talk to someone who knows what he is talking about, of course. Too many know-nothings are answering the phones these days. It is also necessary that the technically knowledgeable person understands that your application is one where you are operating at high power for a long time-- NASCAR, Le Mans, off-shore boat racing, etc--- NOT drag racing. If moly rods would hold up in drag racing they would surely use them. heartbeat and is one reason they use slipperclutches. If moly rods held up think of the money saved from not replacing rods every 8 runs or less. resulting in crank on ground or bearings being beat out. -to heavy for the piston speed. Nascar-Le Mans use short stroke motors [ not 43/8 --41/2 in'' and don't make near the hp we do. Off shore boats can't use the amount of fuel or very high rpms if they want to finish or have pits stops. The 911 roadster only runs to the 4 because they can't run a big enough fuel tank. As a new guy to the boards Ive spent a lot of time reading alot of the builds and just finihsed up yours. Ive gotta say, what a great read its been. Lots of hard work, tenacity and perserverence on your part. Admittedly when I saw Langlo as a last namethoughts of Uncle/Brother Arely came to mind. As a long time drag racer, Ive witnessed many of Arleys kaboomers. Im glad at some point in the build that JOhn explained it was more the late Jay Roach that had more to do with those than Arley. I was blown away when looking at the 200 Club and saw that Arley was a long time memeber of it. Im glad I did go ahread and read the build. Frankie..yeah, ''cousin'' Arley owned the car, Jay the engines, Top Fuel a tough deal with no big sponsers. Jay made a lot of of parts himself Heads -clutch -fuel pump ect. aluminum angle to top of door opening and we flex the window under them when closing. El Mirage will have to get a lot of rain before we run there and the Race Dirctor would have to give us permission to run out of the 200 mph lane. Otherwise it just a wasted trip.